Swan's Market Cohousing is an urban co-housing community with 20 units, located in the preserved and retrofitted 1917 Swan's Market building in the historic Old Oakland neighborhood. It is North America's 50th Cohousing community, is listed on the National Register of Historic Places and is an award-winning innovative mixed-used historic-preservation project, restoring an abandoned old market building. In addition to our Cohousing community, Swan's Market includes affordable rental apartments, retail stores, restaurants, professional offices, public courtyard and is the former home of the Museum of Children’s Art. 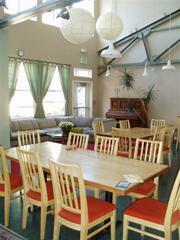 All the traditional components of Cohousing are active here, including common meals 3x/week, monthly work parties, and neighbors helping neighbors. Participation and engagement in the community is high, with residents sharing food from our community garden, tools, time, friendship, resources, and skills. Located in the heart of thriving Old Oakland, Swan's Market Cohousing is 2 blocks from BART, 15 minutes from downtown San Francisco or downtown Berkeley by BART, has a Walkability Score of 98/100 and just about every service you can imagine within a few blocks, including the Farmers Market on Washington & 9th Streets each Friday. Though urban, our outdoor space – “Swan's Way” – is generously planted with fruit trees, vegetables, and artful patio gardens. Our outdoor table is a community gathering spot. Community amenities include a 3,500 square foot common house with large kitchen and dining area, kids’ play room, exercise room, laundry, workshop, community garden, guest room, large patio for dining/entertaining. We value our three community meals a week and residents commit to participating in cooking rotations, as well as additional tasks necessary to support the maintenance and self-management of our community.